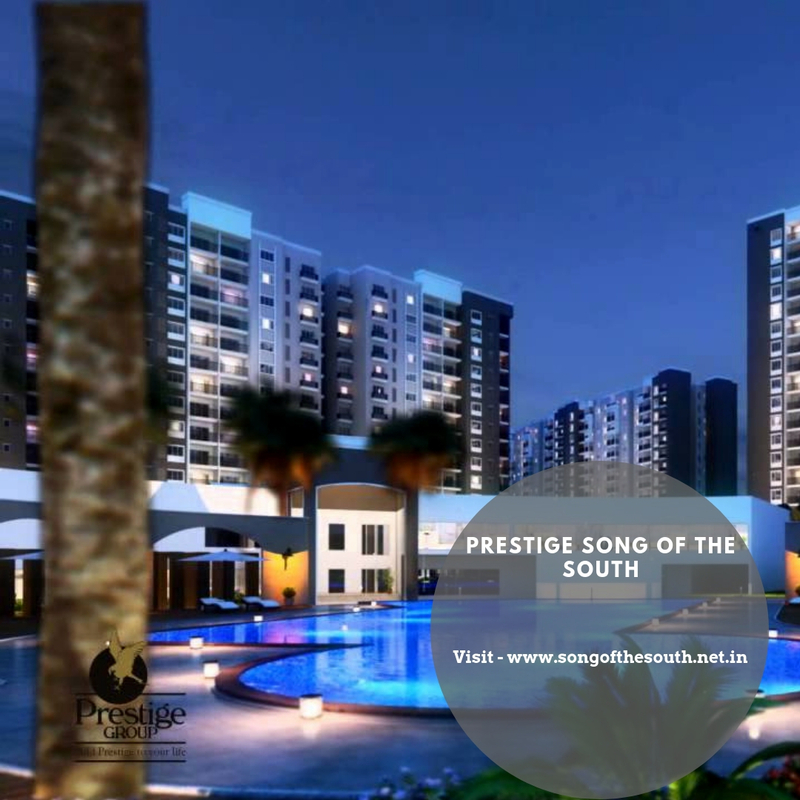 Prestige Song Of The South: Live in carefree abundance, amidst clutter free serenity here! The name ‘Prestige’ deserves and demands prestige and repute, just like its name. The real estate developer group, Prestige Group, have lived up to their name as they are respected and known for their high commitment to create wonderful architectural marvels as well as strong and sturdy projects. Their customers are a happy lot as they have delivered the carved renditions with finesse and grace. Bangalore has witnessed many of their projects. Their next foray here is the wonderful Prestige Song Of The South Bangalore. This is a smart residential project coming up. Bangalore is a commercially important city. It abodes numerous high-tech industries, blue-chip companies, MNC’s, and more. Known for its lovely parks and nightlife the megacity has tremendous employment potential. The huge migrating population makes this city the third most populous city of India. Real-estate developers from across India find this city an ideal working place. Commercial and residential projects with new and innovative ideas are cropping up across the city. This Prestige project is located Off. Bannerghatta Road in Begur, Bangalore. The project is in proximity with some of the most important hubs of the city including, PESIT South Campus, J P Nagar, BTM, Electronic City, Royal Meenakshi Temple, etc. 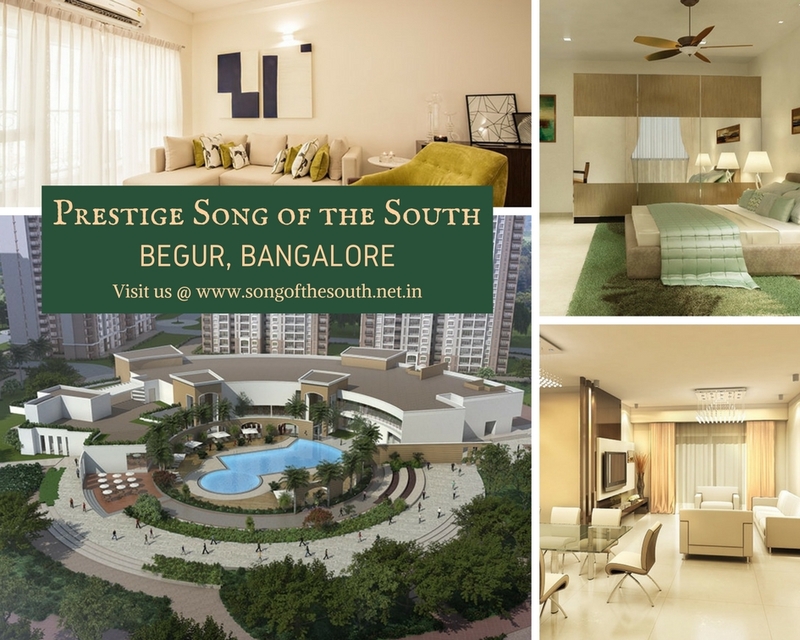 Prestige Song Of The South Begur Road is one of the most promising areas in the city, being off Bannerghatta Road. Nearby are many utilities and locales like PESIT South Campus, J P Nagar, BTM, Electronic City, Royal Meenakshi Temple, etc. MG Road is also 16 km away. The grand interiors of the apartments are spacious and designed for performance. The floorings are vitrified tiles in foyer, living, dining, corridor, and bedrooms. While in the kitchen and bathrooms anti-skid ceramic tiles are used. The windows have a 3-Track UPVC frame along with clear glass and provision are made for mosquito mesh shutters. The Prestige Song Of The South is a huge campus that measures 33 acres. This has been planned well and so there is a lot of open space in the campus. Along these are lined homes in tall towers that are 16 in number. Inside the towers, there are so many home formats to choose from. You can opt for 2, 2.5, 3 and 4 BHK apartments. The dissimilar style of apartments is thus the reason why the campus will have a mixed variety of people, coming together in a shared and united community. The homes here come in sizes that range from 1197 sq. ft. to 2467 sq. ft. Thus, the Prestige Song Of The South Price has a large range, starting from Rs. 56.85 lakhs to Rs. 1.17 crores. You are bound to find one that matches your taste and budget. Targeting a clientele in middle-income groups and premium buyers the project offers everyone something unique. The security in the estate is to be maintained by trained staff 24*7. Features like CCTV camera keeps an eye on every happening in the common area and gates. The Eco-friendly installations made in the project include rainwater harvesting, energy efficient installations and proper waste management. Here there are all types of features that go on to make a happy and feature-rich life for each inhabitant. Facilities for sports, clubhouse, swimming pool, kids’ play area, gym, meditation centre, theatre, green manicured parks, artistic landscapes, etc. are resort-like amenities here. Then there are practical aspects like 24 hours power back-up, water supply and security taken care of well. The campus is eco-friendly with rainwater harvesting, energy efficient installations and proper waste management. Safe, rich, affordable and vibrant – all these make it a wonderful place to stay. The property is on the radar of keen investors and end users and will be a coveted place in the future. Located at Begur, off Bannerghatta Road, Bangalore.